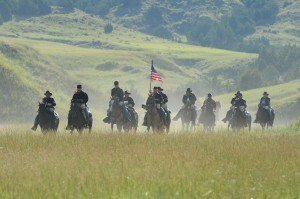 Filming historically accurate reenactments is mission critical to Great Divide Pictures. Given the films we produce are often for the National Park Service, historical accuracy is of prime importance. However, historical accuracy is a very subjective topic, often elusive, and open to wide variations of interpretation. In Part 1 of “Our Commitment to Historical Accuracy,” we discuss our philosophical foundation that motivates our historical interpretation. We explore definitions of historical accuracy, explore literal interpretation versus accurate impression, and how we work with historians. Accuracy in film reenactments is often defined by physical data and fact-based critiques of period correct wardrobe, props, hair, make up, set design and special effects. While we do go to great lengths to present these items correctly (see Part 2), they are not the only way to define accuracy. We are also careful not to fall into the data and fact trap where too many details can bog down a story with textbook information. This is especially relevant when faced with limited financial resources that force creative compromises. Historical perfection on an academic level is extremely expensive, and often impractical in film production. Aside from physical data and fact, the foundation of history is that of telling stories. As storytellers, we must interpret the data and facts for our audiences to better understand the historical event. How we present this physical data and fact is known as interpretation. We believe the interpretation of historical figures and events that best serves the story, is often the best way to approach historical accuracy. This includes allowing for variations of historical plausibility without contradicting accepted fact, and for building scenes that create an accurate impression, rather than a literal interpretation. Because of budget limitations, creating a historically perfect scene is often not practical for aproduction. To be historically accurate we do not need 10,000 soldiers marching in a field. We can create the impression of 10,000 soldiers using just 200, and some savvy camera and editing techniques. Basing a scene on creating an accurate impression is often the best way to preserve authenticity. Literal interpretation is best served for indisputable physical items such as wardrobe, props, hair and makeup to represent an historical figure like President Lincoln. But for things like set design, creating an accurate impression can be more effective. For example, on a recent film, building a period correct Oval Office for a scene with President Lincoln was not within our resources. Thus, we found an interior location with similar period windows, and added correct props based on historic records. But we did not shoot this scene with a literal interpretation; rather we used surreal lighting, atmospheric effects and cinematic camera techniques to create the impression of Lincoln in the Oval Office. The scene with the Lincoln actor was believable, and the techniques used to create the Oval Office impression even added an element of emotional drama to the story. Collaborating with historians is the first step in researching and writing a fact-based script. Historians serve as a critical guide as we pull stories and characters together that best reflect the larger film topic. Chris Wheeler, our Executive Producer and Director, will work with these historians immersing himself in the often complex history. This often involves reading dozens of books and research papers. He will create a film outline with all of the major story points. Then, he crafts a script humanizing these larger stories with first person accounts. We often uncover little known characters with dramatic stories that become some of the more memorable moments in our films. Once the script is vetted by historians and park interpreters for fact and accuracy, we start shooting. Having trusted historians on set is critical to insuring accuracy. We will rely on the historian as a consultant to answer blocking questions and to help guide period correct action such as military formations. Many of our reenactors are knowledgeable historians whom also assist us with how soldiers would conduct themselves in battle. Historians also help catch inaccuracies in wardrobe, props, or makeup, even hair. For example, on the set of the Battle of the Little Bighorn, our Native American hair expert created braids on our male warriors. An historian pointed out that the braids were done with a post 1890’s look with the braid behind the ear. During the 1870’s battle, period correct braids would have been in front of the ears. Thus, we fixed the hair, which now stands out as a detail of great accuracy in the film. While most audiences won’t notice the hair, they may feel the difference in the film. It is these kinds of details that our clients appreciate, and audiences can trust. Filming historically accurate reenactments is one of the major missions driving our film and television productions. No doubt, it is a challenging and elusive goal. While our budgets limit the size and scope of the project, they do not make historical accuracy impossible. Through consultation with historical experts, and creative camera work, we are able to maintain a high level of accuracy. When confronted by variations of what can be considered historically accurate, we return to one of our basic values – the interpretation that best serves the story and the viewer. For over 20 years, Great Divide Pictures has been producing historical films for the National Park Service, public television and the broadcast industry. We strive to interpret, enlighten, entertain and most of all, to inspire viewers about our nation’s fascinating natural and cultural history.